I studied English Literature at the University of York (BA) and the University of Oxford (MPhil and DPhil). I have spent several years working as an editor, developing and producing distance-learning materials for OU Arts modules, and teaching as an Associate Lecturer. I joined the English Department as a lecturer in 2014. My main area of research is eighteenth-century literature. Broadly speaking, I am interested in the print culture of the mid-eighteenth century and in attempts to understand this as part of a history of writing and mediation. In particular, I am focusing on the work of Tobias Smollett (1721–1771), as a critic, translator, historian and hack. One aim is to explore the aesthetics of the Critical Review (a review journal that Smollett helped to found in 1756); another is to explore Smollett’s contribution to historical writing in the period. What unites these projects is an interest in mediation and translation – or, we might say, in the kind of knowledge that is created by rewriting and remaking the works of others. My current work develops previous research into Smollett as a writer of the Scottish Enlightenment. 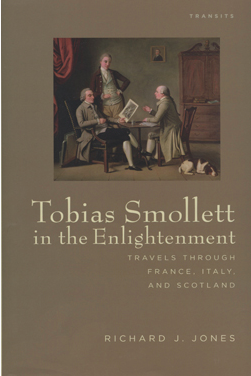 My book, Tobias Smollett in the Enlightenment: Travels through France, Italy and Scotland (2011), was published by Bucknell University Press as part of the series Transits: Literature, Thought & Culture 1650–1850. In this book, I seek to recover Smollett’s identity as a Scottish historian and critic by reading one of his works, Travels through France and Italy (1766), in various literary contexts (notably, Scottish writings on medicine, art, theatre and history). This research led to an interest in the shared literary ambitions of Smollett and the philosopher David Hume (1711–76) – an interest which also finds a place in my current work. Alongside (and in relation to) this research, I am interested in exploring critical writing as a creative practice. What does such writing do? This sometimes finds expression in my blog, antiphysis. I am currently chairing the production of a new, introductory module in the study of the arts and humanities. A111 Discovering the arts and humanities will present for the first time in October 2019 – and will be compulsory for all qualifications in the arts and humanities undergraduate programme. What appeals to me about this module is the opportunity it provides to work across different subject areas and explore why the arts and humanities matter today. This module will replace the first-level module AA100, on which I have previously taught for many years. In addition to teaching at Level 1 (which has also included A105, Voices, texts and material culture), I am a member of the module team for the second-level English module, A230 Reading and studying literature. I have also contributed to the third-level English module A334 English literature from Shakespeare to Austen with units on Molière’s Tartuffe and Rousseau’s Confessions.